Neighbors who saw smoke and licks of fire leaping up behind the Ross Island Sand & Gravel parking lot in the late afternoon hours of July 24 were concerned – as were workers at the plant itself. At 6:24 p.m. Portland Fire & Rescue (PF&R) dispatched units to an approximately 100 x 100 foot square blazing hillside area along the Springwater Trail, accessing it via a private unimproved road down behind the plant's parking area off of S.E. McLoughlin Boulevard. Firefighters from Westmoreland Station 20 began battling the blaze, aided by other rigs – drawing first from their own 1,000 gallon onboard tank, until a water tender arrived to provide an additional supply. The crews were aided by a powerful stream of water shot from the turret of a fire boat in the Willamette River. "The steep terrain made this fire attack difficult for land crews, and the fire boat was very valuable," commented a PF&R official. Just before 7 p.m. the fire was declared out; but crews remained some time longer to make sure all hot spots had been extinguished. 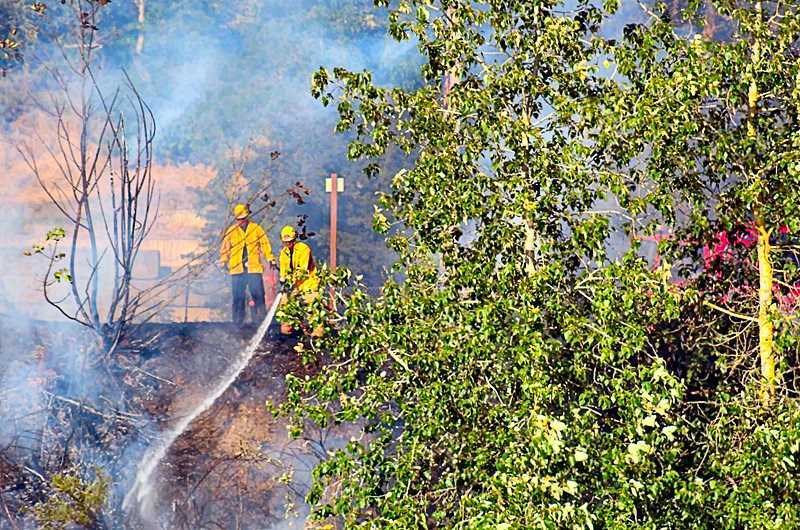 There is no official word about what caused the blaze; neighbors watching the firefighting said that – because the Springwater Trail is closed to the south, in Oaks Bottom – they suspect it may have been started accidently by transients.